Regenerative medicine is a recent branch, but in constant evolution. Until recently there were no means to get important results, but today sophisticated international studies, along with the improvement of medical equipment and technology culture, have allowed a better understanding of the genetic enzyme kit, which can be studied with careful diagnosis to customize treatment of the individual. With the discovery of the opportunities offered by stem cells, when transplanted and encouraged to reproduce, to repair numerous injured tissues, you can get a real biological treatment, acting by exploiting the regenerative capacity of the body, with notable success in clinical application as plastic surgery and aesthetic medicine. Professor Carlo Tremolada undertook years of international scientific research on the use of their own stem cells (ADSC, Stams Adipose Derived Cells) derived from adipose tissue, from which came the Lipogems® technique, patented by him, representing the evolution of lipofilling in regenerative medicine. The system Lipogems®, in addition to being safe and perfectly crioconservabile, can be routed to the obtaining, without the use of enzymes, cell cultures of stem cells of exceptional quality. LIPOGEMS® is the latest in the field of lipofilling: it is a transplant of fat rich in mesenchymal adult (CMA). If it applied especially on the face and décolleté with problems of skin aging resulting from the degradation of the intercellular matrix (wrinkles, indentations, loss Skin Tone) is one of the most modern achievements of aesthetic medicine regenerative. Is also used to improve scars from burns and trauma, as filler for regenerative increase volumes of the face (cheekbones, chin, jaw, lips) and the body (breast and buttocks), with a result very natural and immediate. The Lipogems® system is a disposable kit for liposuction, processing and grafting of adipose tissue. The entire procedure takes place in a single surgical time. Through minimal handling “enzyme free”, in a closed system and aseptic, there shall be a progressive reduction of adipose clusters and elimination of oil and blood residues contained in pro-inflammatory. The entire process takes place in a liposuction in saline immersion system, which allows you to minimize any traumatic action borne of mobile products. Lipogems® The product is characterized by the maintenance of the vascular stromal niches intact, containing mesenchymal cells and pericytes. The product thus obtained is a Lipogems® adipose tissue microfratturato not foam, intended for an autologous use. The use of Lipogems® product has the aim to favor the natural regeneration process of the tissues after the liposuction and finds application in many diseases. 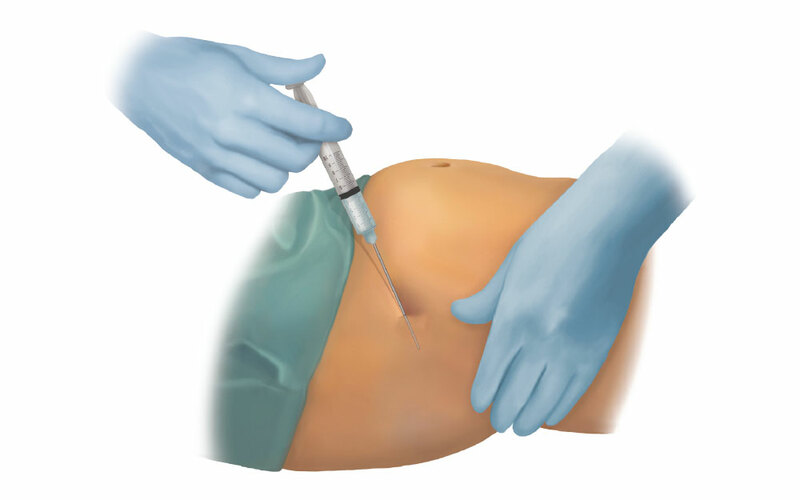 The saline solution containing epinephrine and / or anesthetic is infiltrated into the subcutaneous fat under the skin using a special disposable cannula 20G. 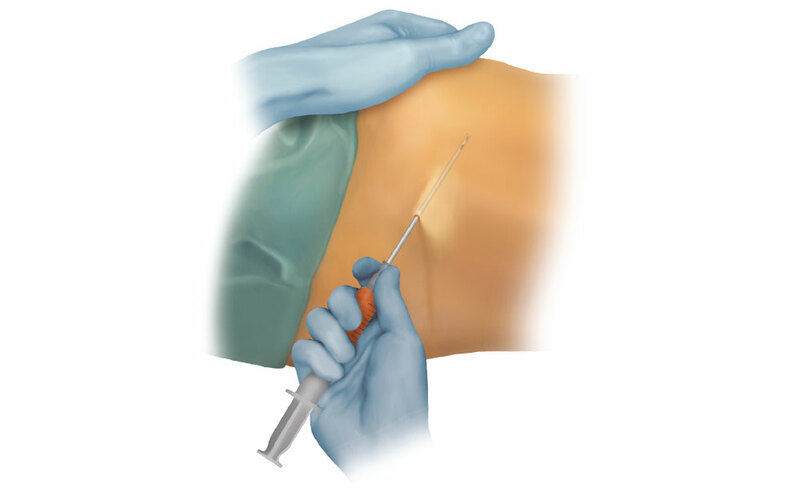 The removal of the adipose tissue is made using a special cannula disposable 13G connected to a syringe vaclok. 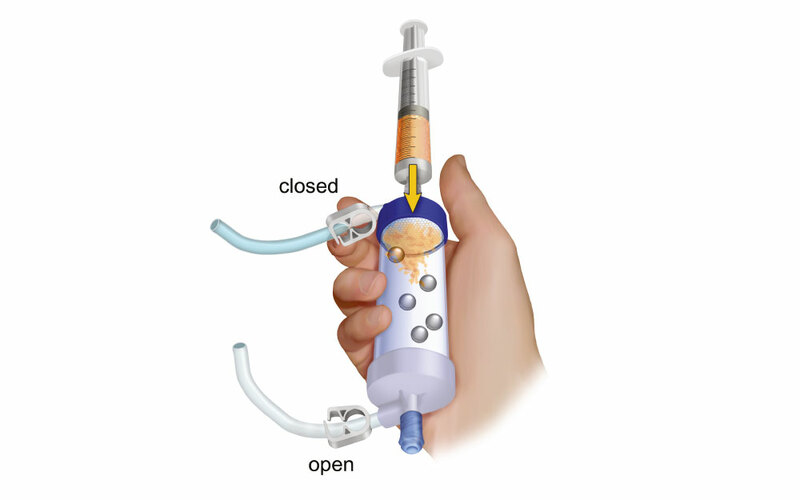 Connect the hose of the blue filter to the bag of saline. Rotating the cylinder with the gray filter upwards. Open both tubes. Fill physiological cylinder holding it vertically, once fully close both tubes. Replace the cylinder with the blue filter upwards. Close the tube blue filter and open the filter pipe gray. 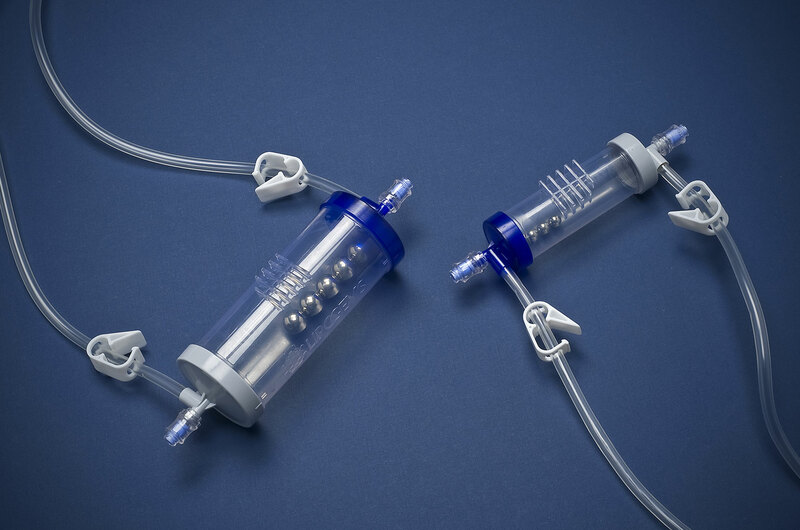 Connect the blue filter syringe with lipoaspirate. Enter the adipose tissue aspirated into the cylinder of processing through the blue filter. 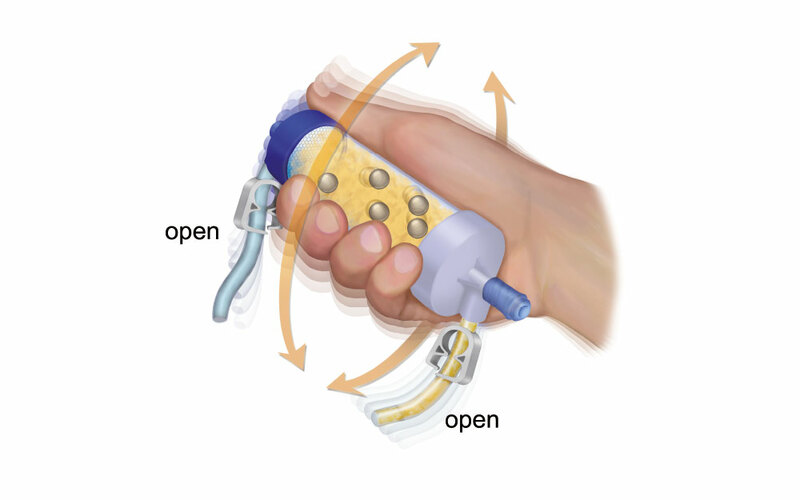 Open both hoses to allow continuous flow of saline and the disposal of waste oil and blood. 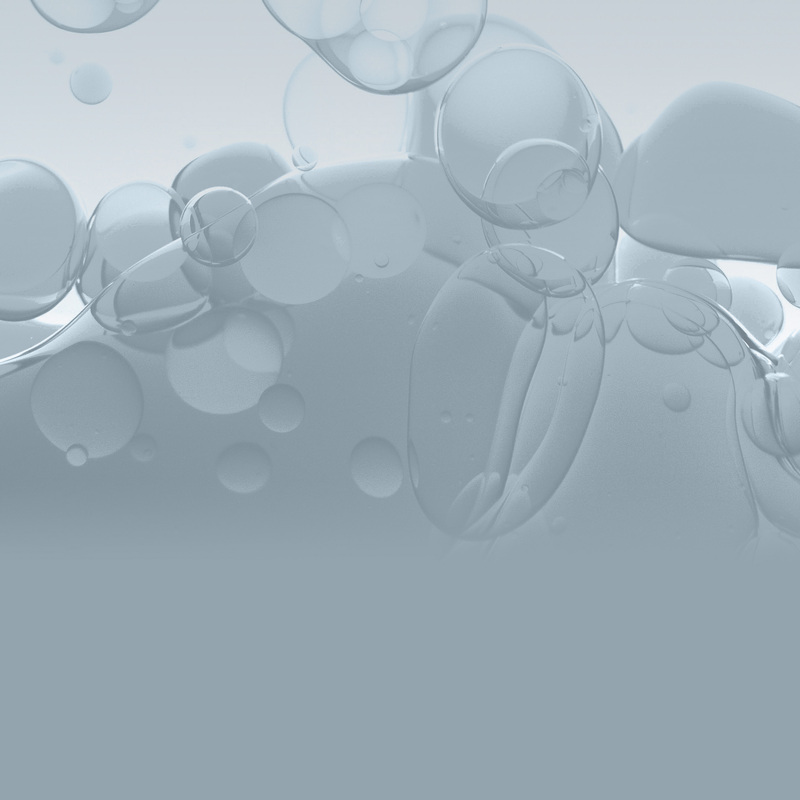 The adipose tissue introduced into the cylinder of processing is subjected to "shakeraggio", the action of the steel balls emulsifies and microfracture further adipose tissue. 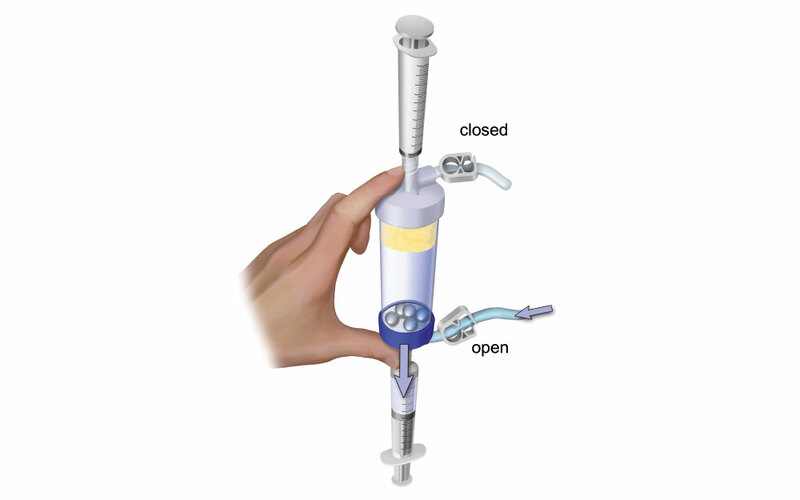 When the saline solution inside the cylinder appears clear interrupt the "shakeraggio" and close both tubes. 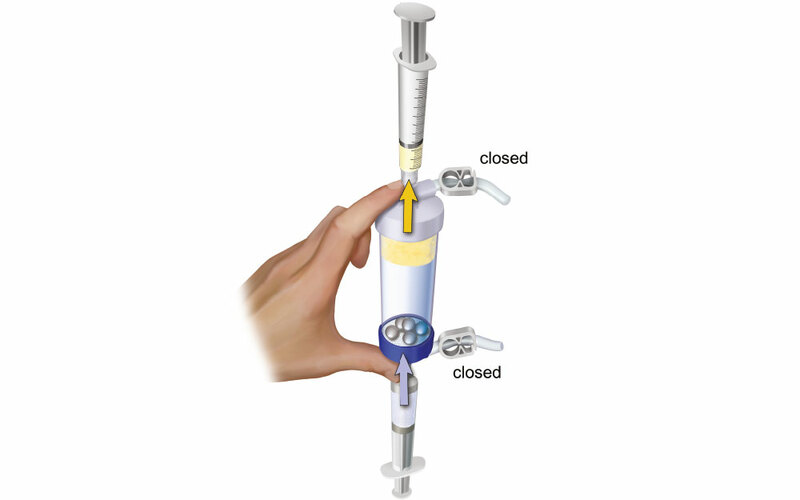 Connect two syringes LuerLock the two filters to enable removal of product Lipogems®. Turn the cylinder of the filter processing with the gray top. Open the tube of the blue filter. Through the syringe connected to the blue filter withdraw an entire syringe of saline. Close the tube blue filter. Holding the cylinder vertically with the gray filter at the top. 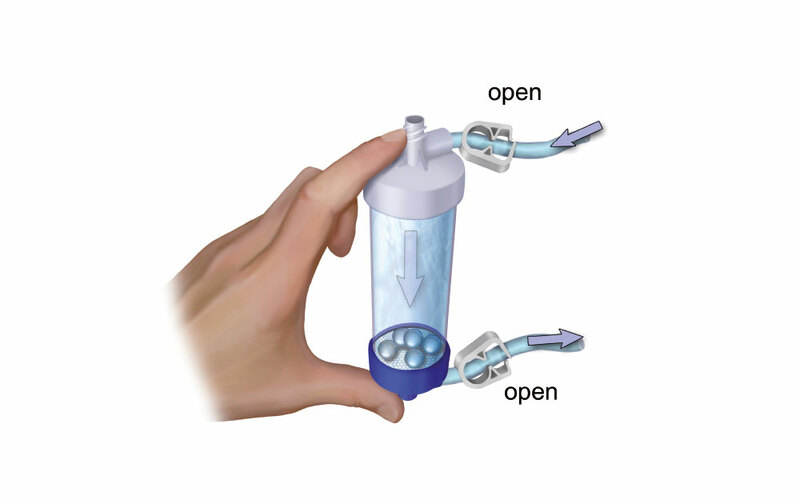 By acting on the syringe connected to the blue filter push the saline into the cylinder, thus making the product Lipogems® will flow through the gray filter into the syringe collection in relation to it. AT THIS POINT THE PRODUCT Lipogems® IS READY TO BE USED. For any information or enquiry, please fill this form. We will recieve your request by e-mail and we will answer as soon as possible.